Development of the "Super Tone Master" mouthpieces by Otto Link paralleled a paradigm-shift in the way saxophone players were thinking about sound in the late 1940s and early 1950's. Players like Ben Webster and Coleman Hawkins were leading a charge that pushed the boundries of what was considered a conventional saxophone sound. They began using larger tip mouthpieces and were putting tons of air through the horn which generated an enourmous sound. They began using vibrato more for inflection as opposed to as a rule and they were interested in a brighter more projecting sound. It was in response to this new jazz saxophone sound that Otto Link began development on the "Super Tone Master" mouthpiece. The origi nal "STM" mouthpieces were manufactured in New York, and are easy to identify as they are stamped "New York" on the shank. The earliest examples of this model are also distinguished by a long wide bite plate. Its interesting to view the development and evolution of the STM mouthpieces with the aid of hindsight. John Coltrane is one of the most influencial players to have used the STM mouthpieces. It was said that he travelled around with his tenor in a case, and a gigbag full of New York and Forida vinatage "Super Tone Master" mouthpieces. Largely because of his association with the STM, a common misconception about this mouthpiece is that it tends to be fairly bright and edgy. While this may have been the case back in the day, its not true by today's standards. In fact, most players today generally regard the STM mouthpiece as being fairly dark in overall sonic charecter with the first New York series being the darkest. While John Coltrane did get a good bright penetrating sound, he also had nearly all of his mouthpieces worked on by mouthpiece specialists Frank Wells and Ralph Morgan and also experimented with wedges and artificial baffels. The New York "Super Tone Master" mouthpieces were first produced in relatively small tip openings. You see lots of 3, 4, and 5's. But larger tip openings were indeed available. At the time these pieces were being marketed, these larger tip openings were considered more for professional players where as the typical amateur player was still encouraged to buy small tip opening mouthpieces. Also, much like the preceding Otto Link model, the New York Tone Master, the New York STM retained the facing number on the bottom of the table, "Table Stamp", and was also stamped with a serial number (generally a letter followed by a 2 digit number). The New York Super Tone Master is often referred to as a "double line" or "double ring" which simply refers to the presence of two lines that are cut into the brass at the top side of the shank. Otto Link continued with the double ring design after he moved his operation to Pompano Beach, Florida, but soon switched to just a single line. 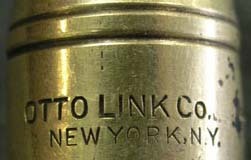 The Otto Link ligatures of this vintage are also considered by many to be the best ligs ever made by link. The earlier ligs of this vintage look the same as the "Tone Master" models, except the Otto Link stamp was removed from the top screw. The reed plate design was once again improved, and allowed for optimal reed vibration.